The ibiza Rhapsody keeps you connected no matter where you go. 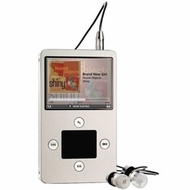 Boasting PC-free, wireless operation, this compact MP3 player offers 30 GB of storage and a "hot button" that instantly connects you to millions of songs, podcasts, and videos. Easy to operate, with simple navigation and selection you can manage with one hand, the Rhapsody is slim, light, and ultra-portable, with a long battery life. And its intuitive, user-friendly design helps you fit more fun into your busy life. Whether you're traveling to work or school, or hanging out at the local coffee shop, take advantage of the Rhapsody's Wi-Fi capability to access the Internet. Browsing is a snap with the easy-to-read 2.5-inch color LCD, and the 320 x 240 resolution lets you enjoy vivid videos and photos. Need to find something right away? The content menus are streamlined and straight forward, so you never have to hunt for what you want to see or hear. Let your Rhapsody showcase your individual style. Airskins let you automatically personalize your player with styles, graphics, pictures, and colors of your own choosing. Have you found a cool picture or song you can't wait to show off? No problem. The included Rhapsody software quickly loads on your computer so you can transfer your favorite images and songs, making everything easy to share with friends and family. Or you can save data from your PC to the Rhapsody, organize pictures into portable digital photo albums, and enjoy click-and-drag access while you're out and about. With the Rhapsody, you'll never run out of entertainment options. Instantly tune to a host of your favorite, preset FM radio stations; enjoy free AOL videos on demand; and bring with you nearly 1,000 categorized podcasts, including free up-to-the-minute news and sports. Over-the-air updates mean you'll never miss the newest available information or services. The Rhapsody also features Bluetooth capability that works with compatible headphones or speakers. Never run out of new music again. The Rhapsody comes with a free 30-day trial (credit card not required) for Rhapsody To Go, a four-million song library. Play or save your favorites in seconds. You also can listen to free, nonstop Rhapsody channels in any genre, completely free of advertisements. At the end of the trial period, your membership will be automatically canceled, with no cost to you. Or, you can choose to extend your membership and listen to up to 25 new songs a month, or play 25 Rhapsody channels without any monthly fee. Wi-Fi wireless connect "Hot Button"